For the first time since the 9/11 terrorist attacks in New York the victims and relatives finally had a place to mourn and grieve following the completion of the memorial at Ground Zero. There is a waterfall where one of the twin towers stood and there are some bronze plaques each naming one of those who died. It is not only New York who has waited so long for a permanent memorial. Relatives and friends of Britain's 67 fatalities have also waited some ten years before finally being given a memorial. One week before the tenth anniversary a sculpture dedicated to those killed during the 9/11 attacks was unveiled in Battersea Park, south London. The 8.5 metre tall memorial has been created from three sections of the World Trade Center buildings, which were destroyed when two airliners ploughed into them on 11th September 2001. American artist Miya Ando's scupture is only temporary however since authorities are still looking for a "more suitable" location [BBC / The Sun / Daily Mail]. Miya Ando said she wanted to "give light back into the community" with her work. "'I thought it was a poetic way to express transformation," she said. "Not only are we having the piece stand upright in a gesture of resilience, but to create something serene and light." Other memorial are less inspiring however. In Grosvenor Square in London which fronts the US Embassy a permanent memorial was unveiled in time for the 3.rd anniversary. It consists of a wooden temple-like structure which stand before a stone plaque embedded into the ground. Although it was one of the first memorials to be built it has been somewhat likened to a garden shed [Telegraph]. The plaque under which a piece of the World Trade Center is buried is more fitting. It is inscribed with part of Henry Van Dyke's poem which was read during a memorial service at Westminster Abbey in 2001. The inscription reads: "Time is too slow for those who wait. Too swift for those who fear. Too long long for those who grieve. Too short for those who rejoice. But for those who love time is not." In towns and cities across Britain and America there are also plaques and memorials placed in honour of those who died on September 11th, 2001. A plaque in front of Romford town hall in east London remembers some 176 members of Aon, a Chicago based firm, who lost their lives. While most of the Aon staff were Americans a few were British. 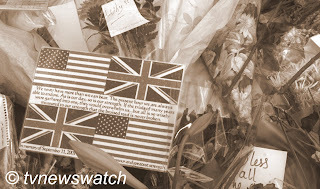 Amongst them was Michael Egan, 51, the Hull-born vice president of multinational insurance company AON, who is believed to have died as he helped colleagues escape from the south tower. He and his many colleagues are remembered with the words, "Forever In Our Hearts". This and many plaques like it were unveiled within a year of the attacks. However some friends and relatives of victims of 9/11 are still waiting. Bureaucracy and red-tape has been a major stumbling block despite support from local government officials and residents. In Billericay in Essex friends and family of Michele Beale, 37, a director with London-based Risk Waters, was attending a conference at the World Trade Centre in New York on the day of the attacks. Ten years on her husband Stuart and their two children Joe and Lizzie are still waiting for permission to have a plaque placed in the town. While only a single bunch of lilies were placed at the war memorial in Billericay town centre on Sunday in central London and at the sites of the terror attacks in the United States, hundreds gathered to pay tribute to those who died. Television news stations carried hours of special programming throughout the day. Sky, BBC, CNN, France 24, Euronews and CCTV all relayed the memorial events live. Other broadcasters dipped in and out of the commemorations and showed documentaries marking the events of 10 years ago. Amongst the reports shown was one on Russia Today which suggest that some 90% of Afghans had little knowledge of the terror attacks with many even failing to recognise iconic photographs of the blazing twin towers. Yesterday Mayor of London, Boris Johnson, said those responsible were "sick and deluded" and called for young people to be taught the history of the events that took place a decade ago. While the events may be clear in some people's minds there are others with little understanding of the attacks. Conspiracy theories still circulate too, something which Johnson also criticised saying he wanted a "controlled demolition" of wacky alternative explanations for the disaster. The events of 9/11 have been accused by some as an excuse for implementing draconian laws and implementing a terror state. Broadcaster Alex Jones has been at the forefront of such theories, not only dismissing official explanations concerning the events of that day, but also saying that such atrocities are being used as an ecuse to further exercise control on what he terms a gullible public. Whatever the truth behind the attacks, the victims and those they left behind should not be forgotten. Those who perpetrated the attacks should be condemned, but so too should those that who have dragged their heels and blocked the way to erecting monuments and plaques in a timely manner. The shame of 9/11 is that too many people have forgotten.